The article below was written for the 75th anniversary celebration of St. Paul's Lutheran Church in 2006. Since that time, God has continued to bless His work here. In July of 2017, Pastor Brett Hinrichs accepted a call and began serving Mt. Calvary Lutheran Church in Decatur IL. After his departure, we continue to have faithful shepherds, as Pastor Kenton Birtell, Pastor Bill Ohlmann & Pastor Dan Weise serving us during our vacancy. In June of 2013, Pastor David Feddern accepted a call and began serving Immanuel Lutheran Church in Atkinson and Butte, Nebraska in 2013. After his departure, Pastor Kevin Schnakenberg and Pastor Don Jenkins served us during that vacancy. In July 2014 Pastor Hinrichs accepted the call to serve St. Paul's. In reviewing the history of St. Paul’s Lutheran Church in Cambridge, one would naturally start with the background of the German Lutherans who settled in Furnas, Frontier, Gosper, and Red Willow County in Nebraska beginning in the 1870’s. But to get a real picture of the original history of St. Paul’s, one needs to go back to 1580 when the Book of Concord was assembled, containing the official confessions and creeds of the Lutheran Church, based solely on the Bible (Sola Scriptura), resulting in the Reformation. By the mid-1800’s harsh rule in Germany resulted in efforts to merge as Protestants into one body, and Lutheranism was bitterly assailed. A large number of faithful Lutherans looked elsewhere for the freedom to practice their religious beliefs. In late 1838 about 650 people left their homeland of Saxony Germany to seek religious freedom guaranteed in a young nation called America. They reached New Orleans and sailed up the Mississippi River, landing in St. Louis, Missouri, in February, 1839. In 1847, the Missouri Synod was created and the ensuing mission work opened many new fields and attracted the attention of many other Europeans who were still struggling against religious tyranny. Between 1841 and 1860, almost 4 ½ million newcomers arrived at our shores, including many from Germany. The opportunity to purchase fertile farmland and lush pastures attracted many of the early German immigrants to Furnas County, Nebraska, and the town of Cambridge near the confluence of Medicine Creek and the Republican River. Cambridge had no Lutheran Church during the first two decades of the twentieth century. Pastors from Lutheran churches of Arapahoe and Elwood were concerned about the lack of spiritual care available to Lutherans in the Cambridge area. They held occasional services hoping to organize a congregation in Cambridge. With the encouragement of the Lutherans in the area, the Rev. William Roessler, Pastor of Trinity Lutheran Church-Arapahoe, canvassed the area in early 1929 and then requested the Mission Board of the Southern Nebraska District of The Lutheran Church – Missouri Synod (as the church body is now called) to place a man in the field to develop a church in Cambridge. The Rev. Walter Landgraf, then a student from the Seminary in St. Louis, was assigned to the field for one year, July 1929 to July 1930. During this time the group, though not yet organized, purchased the old church from the Mennonite Brethren in Christ for $800.00. This structure, not in use, was located on the north side of Nasby Street. It was in this church that the first service was held when the Rev. Herman J.C. Grimm was ordained and installed as the first pastor of the congregation on October 12, 1930. Under the leadership of Pastor Grimm the congregation was formally organized on April 1, 1931. The first officers of the new St. Paul’s Lutheran Church in 1931 were: Thomas Dixson, chairman; August Luhmann, secretary; and Herman Haussler, treasurer. Charter members at the time of organization were Thomas Dixon, August Luhmann, Herman Haussler, Ernest Heien, Reinhardt Puls, and Henry Puls. All charter members are deceased but relatives of some of the charter members are still members of St. Paul’s. From its very beginning until 1955, Cambridge had formed one parish with Zion Lutheran Church, Hendley, Nebraska. At times the pastor lived in Hendley and at other times in Cambridge. Since 1947 the pastor lived in Cambridge, following the purchase of a parsonage by St. Paul’s Lutheran Church. Pastor Grimm relinquished his office on October 23, 1938, and entered the Chaplaincy of the United States Army on November 27, 1938. The Rev. Alvin R. Lade of Norton, Kansas, was then called. He accepted and was installed April 3, 1939. Before the United States had fully recovered from the Great Depression, it was plunged into another World War when Pearl Harbor was attacked on December 7, 1941, by the Japanese. In addition to Japan and Italy, Germany was once again our foe, but by this time, the feelings of animosity toward those citizens of German ancestry had faded away. A combination of experience, tolerance, and time brought this about, with many of the distinctively-German old-timers long gone. Even though many of the Lutherans that had settled in Nebraska and Furnas County were of German descent, the hand of Christian love was extended to the enemy as well. German prisoners-of-war were held in the United States, including two nearby camps located at Atlanta and Indianola in Nebraska. In addition to local Missouri Synod pastors ministering to the prisoners-of-war housed in Nebraska, our Synod also had about forty chaplains serving our troops abroad, as well as about forty civilian pastors ministering to the military camps near their homes. The pastorate of the Rev. Lade continued until November 13, 1942, when he accepted a call from Immanuel Lutheran Church, Arapahoe. A vacancy of three years followed. On June 22, 1947, several weeks of unusually wet weather and overnight rainfall culminated in a flash flood of Medicine Creek on the east side of Cambridge. The water began rising about 5:30 a.m. on Sunday morning before church services and inside of two hours Medicine Creek had crested. Many people were caught in their homes still in bed while others were aroused by the noise and went outside only to be swept away by the flood waters that were quickly rising. At its deepest, the water stood 10 – 15 feet deep in the low-lying area in the northeast part of Cambridge. 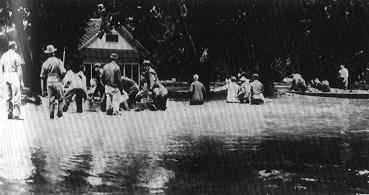 Thirteen people lost their lives and drowned in the roaring floodwaters of Medicine Creek and 175 people received medical treatment. 250 families were affected by the flood and 125 people were unable to return to their homes for over two weeks. Thirty homes and 10 trailer houses were completely destroyed and another 65 buildings were ruined. The following spring a dike was built around Cambridge to protect the town until Medicine Creek Dam was finished. On November 4, 1945, the Rev. Robert J. Leege of Rusking was installed as pastor. He served until November 7, 1948, leaving to assume a pastorate at St. John’s Lutheran Church in Culbertson. Through the faithful work of these early pastors, the congregation grew slowly, but steadily. The Rev. A.S. Gedwillo, who had been serving a church in the state of Maryland accepted the call of the congregation and was installed on February 13, 1949. During his pastorate, the mortgage on the parsonage was paid and extensive improvements were made on it. In late 1949 and in 1950 plans were discussed for remodeling the old church and pledges for remodeling were received. Pastor Gedwillo accepted a call to El Dorado, Arkansas, before the goals for remodeling were completed. His farewell sermon was given February 11, 1951. A student graduate from Concordia Seminary—Springfield, Illinois, Max E. Heinz, accepted the call assigned to him. He was ordained and installed on July 15, 1951. Soon after Pastor Heinz assumed his duties, the congregation realized that remodeling the church building would cost excessively more when compared to its size and usefulness. Churches in the Cambridge area were inspected for ideas. After frequent discussions and after consultation with an architect, it was decided to relocate and build a new church. Under the guidance of Pastor Heinz, the congregation of 42 Communicants resolved on March 18, 1952, to request a loan from the Mission Board of the Southern Nebraska District, and if granted, to build a new church. The request was granted. The small congregation of 42 Communicants then proceeded to build a new House of God under His blessing. A new location was purchased from Lloyd Richardson. It was decided to use as much material from the old church as was possible in the new structure. On Friday, May 23, 1952, work began in dismantling the old church building. Ground-breaking at the new location was held August 23, 1952. The congregation used the auditorium of the Butler Memorial Library with the permission of the Library Board while without a church building. Cornerstone laying ceremonies took place after the regular morning service on October 12, 1952. Members of the building committee placed the cornerstone into position. They were Alvin Leibbrandt, Victor Wendland, and Calvin Dixson. Included in the items placed in a copper box and then inserted in the cornerstone were Lutheran literature; a list of the membership and officers of the congregation; a list of Federal, State, and City officials; the latest issue of The Cambridge Clarion and The Combine Edition; one 1952 nickel and three 1952 pennies. As old lumber from the previous church was used in construction of the new building, it was discovered that some lumber was marked with the name and date of the Chicago World’s Fair. The lumber had apparently been used for buildings at this Fair! St. Paul's new house of worship at 719 Park Ave.
Three services were held on the Sunday of dedication, June 21, 1953. Over one thousand attended the services. The Rev. W.W. Koenig of Lincoln, then Chairman of the Mission Board of the Southern Nebraska District, The Lutheran Church – Missouri Synod, was the guest preacher in the morning service. The Rev. David Kreitzer of Hastings, who had served the congregation during a vacancy in 1939, preached in the afternoon service. A former pastor, the Rev. Robert Leege of Culbertson, delivered the message for the evening worship service. A combined choir with members from Lutheran churches in Arapahoe, Hendley, and Cambridge also added to the worship of all three services. E.M. Schroeder of Arapahoe was the director. The new church had a seating capacity of 120 in the nave plus 30 in the balcony. The cost of the church, including the lots which were purchased at the time of the building, was approximately $20,000. Shortly after the dedication services, Pastor Heinz accepted a call on June 26, 1955, to serve a congregation in Forest Park, Illinois. Pastor Heinz was followed by the Rev. Albert F.L. Schroeder of Waco, Nebraska. Pastor Schroeder was called August 19, 1955, and installed on September 23, 1955. He served until August 3, 1958, when he went to serve a congregation in Central City, Nebraska. A call was sent to seminary candidate, Wilbert J. Sohns of Concordia Seminary—St. Louis. He was ordained and installed in the parish on July 19, 1959. During Pastor Sohn’s pastorate, the congregation again felt growing pains. 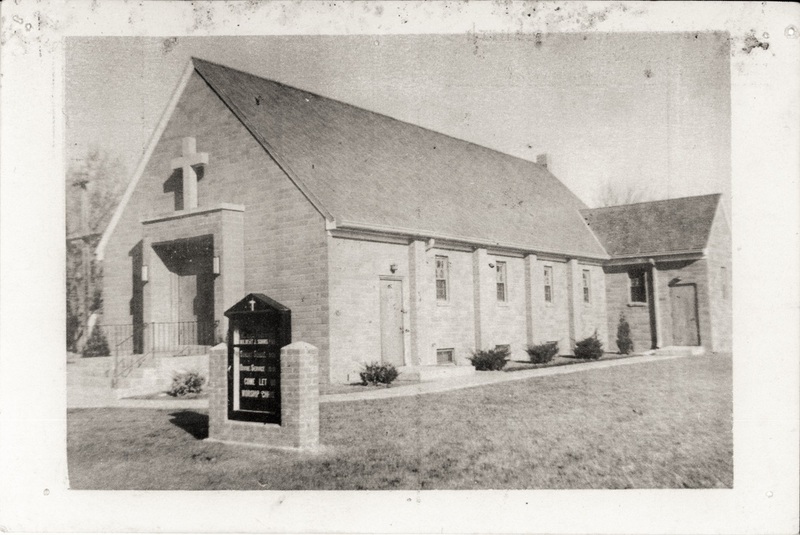 In January 1960 a discussion began on building an addition to the church building in order to have adequate facilities. Plans were made. Bids for an addition and remodeling were let, and the General Contract was awarded to Britton Construction Company of Lexington, Nebraska. On April 8, 1962, St. Paul’s Lutheran Church conducted a ground-breaking service. Former pastor Max Heinz of Kearney, Nebraska, was the guest speaker for this special service. Taking part in the ceremonies were Ernest Stillman, Eric Knehans, Pastor Heinz, Louis Schaffert, Pastor Sohns, Charles Schroeder, Harlan Chambers, and Clarence Leibbrandt. The same month, Pastor Sohns accepted a call to Casper, Wyoming, and left Cambridge on April 29, 1962. The Church Expansion Committee carried on their plans to more than double the present facilities. Seating capacity was increased to 225 in the nave of the church. Four class-meeting rooms were added to the ground floor and eight classrooms were added by remodeling the basement. A new parish hall measuring 30 feet by 58 feet included a large kitchen and a rest-room. Over 5,000 square feet in all were added. The full committee of the church Expansion Committee was Clarence Leibbrandt, chairman; Erich Knehans; Harlan Chambers; Charles Schroeder; Louis Schaffert; Ernest Stillman; and Victor Wendland. Dedication of the addition took place on February 24, 1963, while the Rev. G.A. Weinrich was serving as vacancy pastor. The Rev. W. J. Sohns delivered the sermon for the morning service. In the afternoon service, the Rev. Max E. Heinz was the speaker. Organists for the day of dedication of the addition were Mrs. Harvey (Dorothy) Henry in the morning service, and Mrs. Dorothy Leibbrandt for the afternoon service. St. Paul’s senior choir, directed by Roger Schroeder, and St. Paul’s junior choir, directed by Mrs. Clarence (Lois) Helms, presented music for the day of celebration. Plans for the addition and remodeling were developed by Robert Bigg, architect, and Harold L. Tompkin, designer, both of Lincoln. While the construction and remodeling of the addition and church building were underway, the congregation worshipped in the chapel of Lockenour’s Mortuary for five months. The service folder for the dedication of the new addition. A candidate from Concordia Seminary—Springfield, Illinois, Jack D. Heck, was called. He accepted and was installed on July 23, 1963. Pastor Heck served until April 19, 1966, when he went to Rock Springs, Wyoming, to serve another congregation. The Rev. LaVern R. Bellamy form Sheboygan, Wisconsin, was installed at St. Paul’s Lutheran Church on February 4, 1967. He served the congregation through the end of February 1971 and went to Wyoming to begin a pastorate at another parish. A rapid period of growth in the 1960’s came through transfers from Lutheran congregations whose members lived in the area or moved into the Cambridge-Holbrook area. Among the churches which contributed members to St. Paul’s Lutheran Church in Cambridge were Salem Lutheran, Arapahoe; St. Matthew Lutheran Church, seven miles northwest of Arapahoe; Immanuel Lutheran Church, northeast of Arapahoe; and Zion Lutheran Church, Hendley. The first service at the lake mission at Harry Strunk Lake on July 2, 1972. On April 16, 1971, the Rev. Gordon A. Peterson of Seguin, Texas, was installed as pastor. Pastor Peterson and his family moved into the new parsonage at 1319 Nelson, bought by the congregation when he accepted their call. The congregation started a lake mission at Henry Strunk Lake on July 2, 1972. The site was made available by Merlin Stuhr. Members of the congregation prepared the site on Trail 3 by the lake. Pastor Peterson served St. Paul’s until June 30, 1977, when he resigned his call from the ministry to take a job in the secular world. On April 2, 1978, Rev. Vernon Knight from Rochester, Indiana, was installed as pastor at St. Paul’s Lutheran Church. Pastor Knight helped St. Paul’s congregation celebrate their 50th Anniversary on Sunday, November 22, 1981, with former pastor, the Rev. Max Heinz, preaching at the 10:30 a.m. service and former pastor, the Rev Wilbert Sohns, preaching at the 2:00 p.m. afternoon service. Pastor Knight accepted a call to Waveland, Mississippi, on December 29, 1985. Pastor Knight left Cambridge in January of 1986 and a Selection Committee was formed to fill the vacancy. The Rev. John R. Schmidt accepted the call and was installed on August 31, 1986, as St. Paul’s pastor. Pastor Schmidt served St. Paul’s until he accepted a call to serve Christ Lutheran Church—Nebraska City, Nebraska, on February 11, 1990. A call was sent to seminary candidate Don F. Thompson, from Concordia Theological Seminary—Ft. Wayne, Indiana, and he was installed on July 22, 1990. Pastor Thompson served St. Paul’s longer than any pastor in the history of the congregation, from 1990 – 2003, when he accepted a call to serve the congregation of Trinity Lutheran Church, Cortez, Colorado. The Rev. Dr. Carl Lilienkamp, pastor of Trinity Lutheran Church, Arapahoe, began serving the vacancy in Cambridge when Pastor Thompson left in October 2003. Rev. Lilienkamp accepted a call to Grace Lutheran Church in Wayne, Nebraska, a year later in 2004 and St. Paul’s was once again without a full-time minister. We were a church without a pastor until Rev. Carl Pullman came out of retirement. In October of 2004, Pastor Pullman started coming down from North Platte, Nebraska, to serve our vacancy. What a great blessing God bestowed on us. In our searching for a full-time pastor, the congregation voted to call an Alternate Route Vicar from Concordia Seminary—St. Louis, with the intentions of calling him at the end of his vicarage assignment. Vicar David A. Feddern, of St. Louis, came to us in July 2005. For a year, with Pastor Pullman’s guidance, we watched Vicar Feddern grow in God’s calling. On July 2, 2006, Vicar David A. Feddern, was ordained and installed as our full-time pastor, and once again God has blessed us with a full-time keeper of the flock. Growth during the years is measured in many ways, including membership. Membership is measured by souls, all baptized members which includes infants, and communicants, those having been confirmed and 14 years old and above. In 1931, the year St. Paul’s was formally organized, there were 57 souls and 32 communicant members. In 1951, there were 91 souls and 48 communicants. In 1974, when the city of Cambridge celebrated its 100 year anniversary, there were 250 souls and 175 communicants. Currently, there are 212 souls and 184 communicant members. Auxiliary organizations of the congregation have served the purposes of the entire membership well over the past 75 years. They include the Ladies’ Aid, Lutheran Women’s Missionary League (LWML), the Men’s Club, Lutheran Laymen’s League, and the Youth League. Each society has been associated with the corresponding organizations of the church body, The Lutheran Church – Missouri Synod. Their contributions to the larger work of the church body are also considerable. As we reflect on the past 75 years with gratitude, humbleness, and awe, we dedicate ourselves to the future with determination, with confidence in Christ Jesus as our sword and shield, and with the assurance of eternal life for all believers. Deo Gratias – Thanks Be to God!